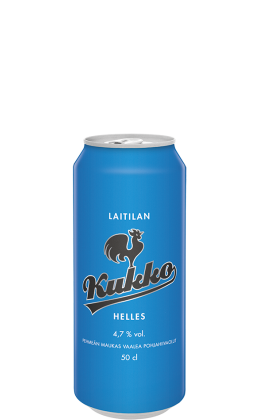 Kukko Helles 4,7 % alc. 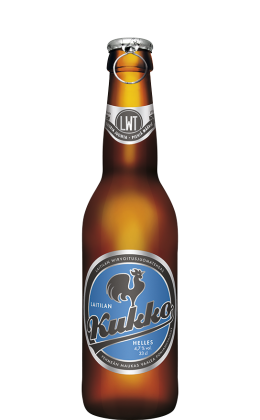 Laitila's Kukko Helles is a filtered, pale bottom-fermented beer. The roots of this beer type can be found in Munich of the late 1800s where it was created as a German answer to the Czech Pilsner. The Helles has more unfermermentable sugars than the conventional Pils, giving the beer a distinctively rich body. The hoppiness is simple, but clearly defined. Pale malts and German hops (Magnum and Perle) are used in the brewing of Kukko Helles. Water, malted BARLEY (Pilsner, Caramel Pale), hops (Magnum, Perle).